Anthony, who was 31 when his studies began, was slightly apprehensive about starting university as a mature student but soon settled into student life. 'I was pleased to see that my course attracted a wide range of ages and people from many different backgrounds, so I was soon put at ease. I met some great friends who I still regularly keep in touch with,' Anthony explained. Placements are an integral part of courses within Teesside University’s School of Health & Social Care and Anthony relished the opportunity to get to work in emergency care and community settings. He worked on a shift rota alongside a dedicated mentor and developed core skills in how to assess, manage, treat and refer patients. 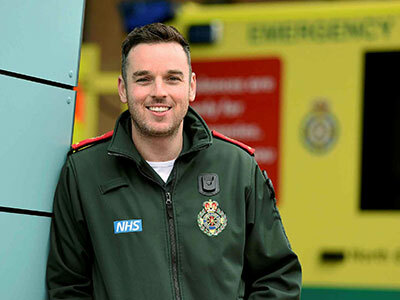 Anthony said: 'The placements allowed me to get complete exposure of what it’s like to work on the road as a paramedic and also gave me an insight into other specialised roles. Programme Leader for BSc (Hons) Paramedic Studies, Chris Moat has commended Anthony for his hard work and commitment during his studies. Chris said: 'Anthony worked exceptionally hard throughout his three years on the programme. I often receive positive feedback about Anthony from operational staff – he is an excellent example of what can be achieved through hard work and dedication. Now that Anthony has qualified, he is working in his dream role at the North East Ambulance Service and he hasn’t looked back. 'My decision to go to University and study to be a paramedic has been one of the best decisions I’ve ever made. A degree in paramedic practice put Anthony O'Connor on a whole new career path.